Dragon1 is an open EA Method. It is an open standard. 'Open' means that, although the method and the specification is copyright protected, the specification of the method is freely available and/or via text books at nominal costs. It is a standard because in over 100 countries people are using Dragon1 to create EA models. Dragon1 can be used by anyone for what its meant to be used: Enterprise Architecture, without making parts of Dragon1 less open or including it in other methods or frameworks. Dragon1 as method and framework describes the why, what and how for working with enterprise architecture (a.k.a. enterprise architecting). Dragon1 as open EA Method offers a product, process and program/project-oriented approach for Enterprise Architecture. The added value of Dragon1 Architects is to increase the capabilities of organizations. As an architect, you can focus on creating products quickly by filling up templates without working in a process or project. You can also choose to do the activities of the process which as a result sometimes leads to the creation of products. You can also choose to work program/project oriented, meaning a combination of process-activities and producing products. Any way that fits you best you can do with Dragon1 open EA Method. Enterprise Architecture is a field of work that helps to innovate and control complexity and change. Organizations want to survive and therefore they need to change to adapt to the changing environment (ecosystem). But continuous change leads to complexity, if not managed. Enterprise architecture is a way of working where one can reduce complexity or make it manageable, by means of standardization and overviews. Next to change organization want to compete or offer clients better and new solutions. For that organizations need to innovate. But in order to be able to innovate sometimes, fundamental strategic changes need to be carried out. 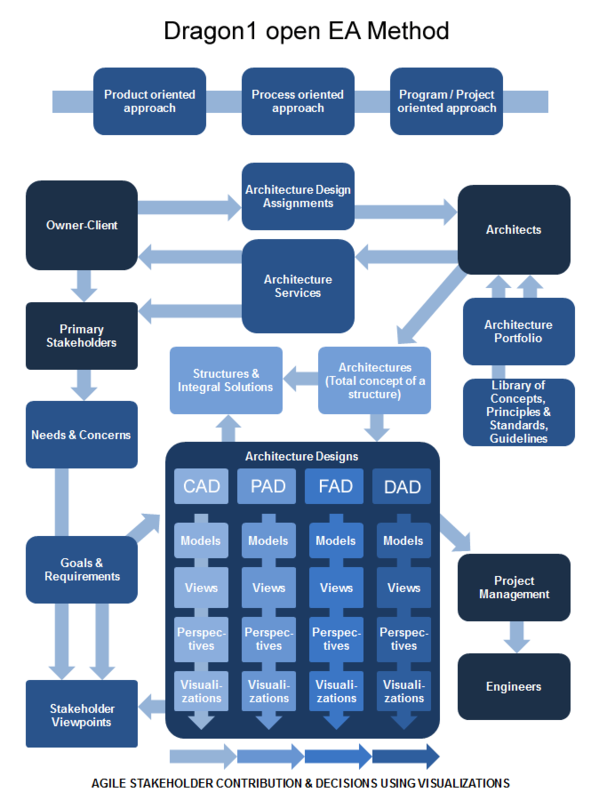 Here also enterprise architecture guides you. Together with the stakeholders the architects create programs of requirements. A study for enterprise architecture based on Dragon1 often takes 4 years and after 3 years of practice as enterprise architect someone really becomes an enterprise architect. For those who want to learn Dragon1 different training courses are available. The basic training course Dragon1 Foundation (level 1), using the Dragon1 Fundamentals book, is only 2 days and gets you aware and started. Next the training course Dragon1 Practitioner (level 2), using the Dragon1 Fundamentals book, is only 2 days and gets you creating your first architecture products. If you are an experienced architect, let's say in the TOGAF and ArchiMate approaches, we have a Bridge Training for you available. In only 5 days you will learn how to make use of Dragon1 is an addition to or instead of TOGAF and ArchiMate. Dragon1 makes a point of definitions. The better the definitions. the better the products (artifacts) are you create. Dragon1 brings science into Enterprise Architecture. Empirical evidence and experiments form the bases for formulating definitions. As an example here follow the definition for architecture in Dragon1. Architecture Definition: The Architecture for a structure is a Total Concept for a Structure, consisting of a coherent set of constructive, operative and decorative concepts ('Firmitas, Utilitas & Venustas', - Vitruvius, red.). If you design and realize a structure using a total concept like this, you can predict that the quality of the structure will be higher then when designing and realizing a structure without. This because when starting at the conceptual level for the design you are able to find answers (fitting concepts) for conflicting or mutual excluding requirements and you can find answers (fitting concepts) for future requirements. Way of Thinking - What is Dragon1's position on certain topics? How does Dragon1 view enterprise innovation? What function does it give enterprise architecture? Way of Working- How are architects and other roles supposed to work? What activities do they carry out and what products do they make? Way of Representing - What is the Dragon1 way of modeling, visualizing and documenting architecture? Way of Supporting - What tools are their for architects and other roles to do the work in the Dragon1 way? In Dragon1 we define ability, disability, capability next to concept and principle. Abilities are how well you can perform a function without any help or support. Capabilities are how well you can perform a function with help and support of means and technology. A disability is you as an organization cannot perform a function, even with help or support. Note: a capability is not how well you should be able to perform a function. Next to capabilities Dragon1 defines concepts. They are similar to capabilities, but in essence different. Architecture is defined as a set of concepts, not as a set of capabilities. A concept is an approach or idea, abstracted from its implementation. The concept principle is the way a concept works, its working mechanism. 24 x 7 Self Service and Printing bridge elements in 3D are two concepts and two capabilities. As a concept, they exist without being applied or used in the company. We will look inside of them, at their principles, how a concept works and what elements are needed. As a capability, we will look only to the outside of them. A capability cannot exist is an organization cannot execute a function at a certain level of performance. In architecture, it is much better to work with concepts than with capabilities as a core construct. Dragon1 defines enterprise architecture as the total concept of an enterprise, so the better you design and implement a total concept, the better you can perform functions. Architects are designers of total concept, so Dragon1 Architects will design technical solution (forms) show what you as an organization need to improve on the ability side or need to organize or cooperate on the capability to remove a disability. Dragon1 defines principles as working mechanisms and not general rules or guidelines. For example: Single Source of Truth is a concept. That concept works in a certain way so that it brings benefits. The principle of SSOT concept explain how that works: by storing and retrieving data only from its appointed official source, it is prevented that these inconsistent versions of that data will exist. In our world on earth, this is pretty much always true. If you create a Principle Details diagram of this principle (=working mechanism), that diagram will support decision making and guide development in innovation projects. Formulating principles as generic rules or guidelines will hardly lead to the same effect. This model defines an enterprise strategy reference model, enterprise architecture reference model and business change reference model. These three models can be found here below. Dragon1 as open EA Method defines a reference model for enterprise strategy. 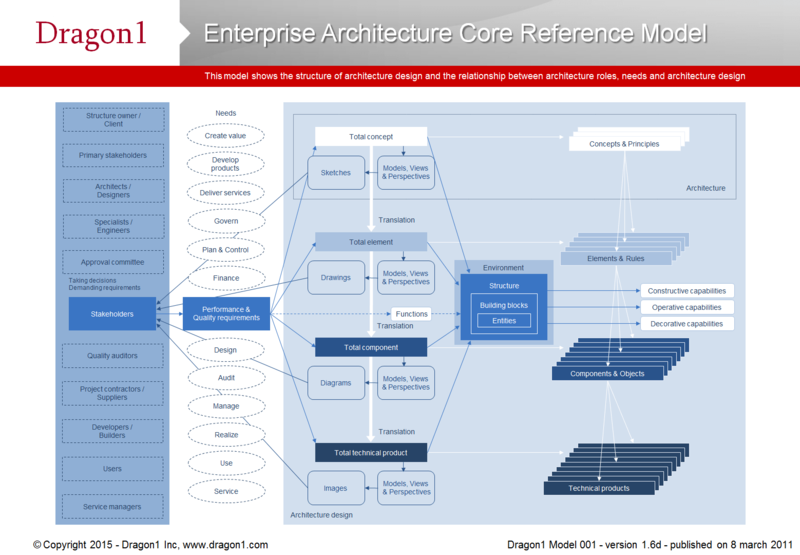 On Dragon1 you can re-use this reference model to make it part of your enterprise meta model. 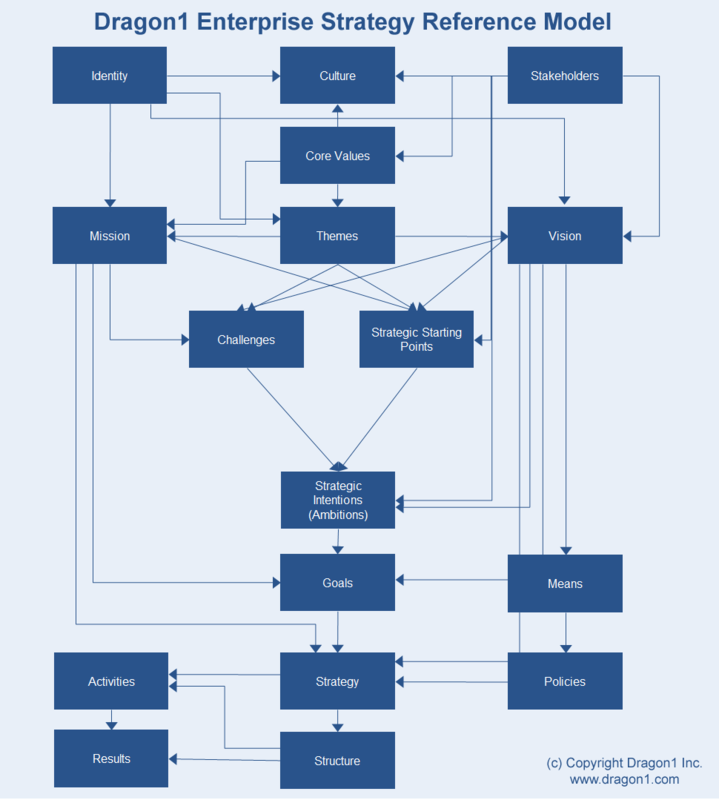 And of course you can alter the reference model to your own theory about enterprise strategy. 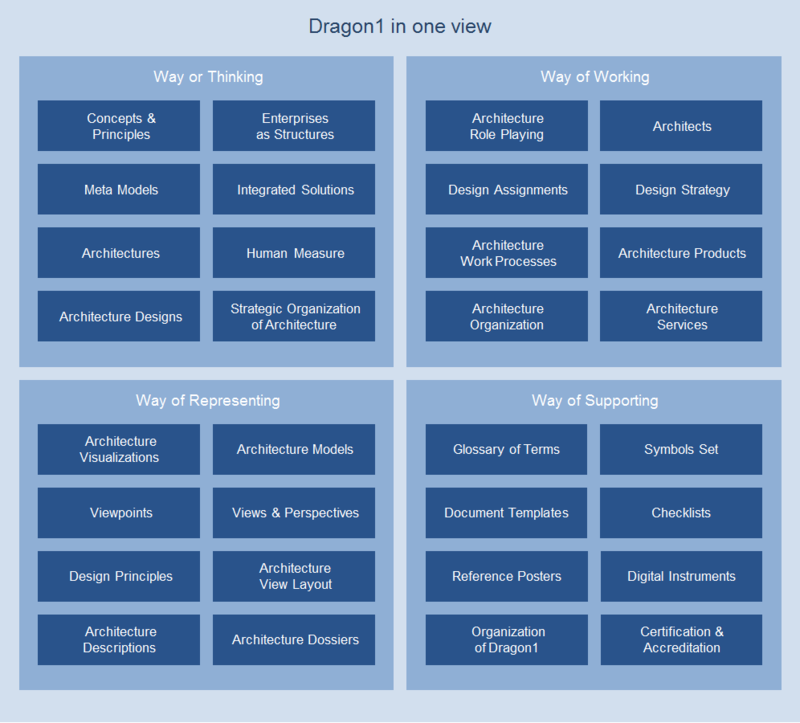 Dragon1 sees Enterprise Architecture as Total Concept for an Enterprise Structure. In general the Architecture of a Structure is seen as the Total Concept (with a coherent set of Constructive, Operative and Decorative Concepts) of that Structure. The Dragon1 EA Core Reference Model below shows a generic decomposition of an architecture of a structure with its mot important entities and relationships. Part of Dragon1 is Dragon1 EA Framework. Dragon1 EA Framework is a set of reference architectures, with reference concepts, principles, building block, patterns, models and views that you can use to quickly create your own enterprise architecture, reference architecture and solution architectures. Dragon1 Framework for Enterprise Architecture has five basic reference models in its core (called the Big Five): enterprise reference model, governance reference model, business (processes) reference model, information (system) reference model and technology/it-infrastructure model.